Have you ever heard of Bobbie the Wonder Dog? 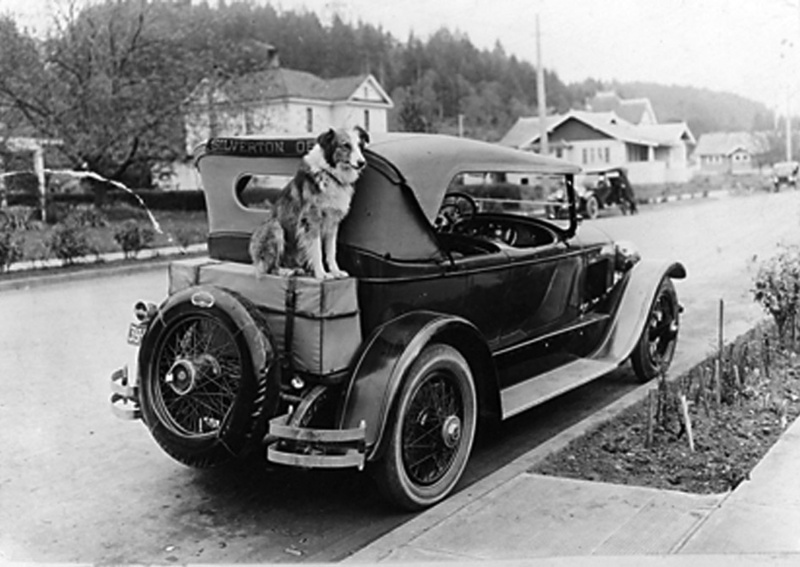 Bobbie was a mixed breed collie who hailed from the state of Oregon back in 1923. He lived with his people, Mr. and Mrs. Frank Brazier and their two daughters, Nova and Leona. Bobbie would love to run and play on the farm where he spent most of his time with the family. Eventually the family moved into town and concerned that the small confines of city life would be too much for a farm dog like Bobbie, the family sold him to the friend who was going to take over their farm. But Bobbie didn’t give up on his family and soon found them on his own, walking into town every weekend and returning to the farm by Monday. Eventually the family bought him back (at three times the price) and Mr. and Mrs. Brazier decided to take Bobbie with them on a trip back East to Indiana. While getting some gas, Mr. Brazier saw Bobbie getting chased by four other dogs. He was confident Bobbie would find his way back, but after an hour or so, Bobbie didn’t return. Pretty soon, the Brazier’s started to worry and went looking for the dog, but to no avail. They searched, made phone calls, even put in an ad in the local paper, but nothing. After three weeks of visiting in the area, they decided to head home, heartbroken over the loss of their dog. Six months later, while walking down the street, Nova, the youngest daughter spotted a mangy, grimy, lean dog walking along and noticing the similarities shouted, “Oh look! Isn’t that Bobbie?” At the sound of his name, Bobbie came running up to Nova and licked her all over. He had returned home. No one knows for sure how Bobbie knew the route to take or how he knew which way to even go. He had traveled over 2,500 miles to reach the Brazier home, but somehow, Bobbie had an innate sense of where to find home. Bobbie’s story is incredible, but he is not alone in making miraculous journeys. There’s the story of Howie the Persian cat who crossed the Australian Outback to find his home. Misele the farm cat who traveled nine miles into town to find her farmer who had been taken to the hospital even though she had never been there before. And Troubles, a scout dog for the military, who was flown into the jungles of Vietnam by helicopter and was abandoned after his handler was shot and taken to the hospital. Troubles found his handler after trekking through the jungle on foot for more than 10 miles in unfamiliar terrain and searching for him tent-by-tent once he made it back to camp. These are only a few of the seemingly amazing stories of animals able to find their way home despite all the obstacles. Yet if we can believe that God could create an animal that can find its way home despite all the odds, couldn’t we also believe in a God that would put it within us to find OUR way home as well? To find OUR way back to God? He as much told us that he would. If you have a Bible or a Bible app on your phone, would you please go to the Old Testament book of Jeremiah, chapter 31 beginning with verse 31. Jeremiah 31:31. Our passage this morning takes place in the time when the people of Israel are in exile. They’ve been taken over by the Babylonians and removed from Jerusalem by force and scattered throughout the land. God told them this would happen, but the people of Israel didn’t listen. Most of them had started to again follow pagan gods and had drifted away from their faith. Can you imagine how frustrating that must be? I know God’s above that, God’s better than that, but imagine if you were in God’s shoes how frustrating that must be? He makes this covenant with Abraham and again with Moses and again with David. I will be your God and you will be my people. I will be your God and you will be my people. And he does it. He is faithful to the people of Israel. But time and again they drift away. Then something bad would always happen. Each and every time. They drifted away and something bad would happen. And they would come crawling back. And every single time God forgives them. But as soon as they are comfortable, they drift away again. God tells them not to do this. He warns them that there are consequences for this constant drifting away. He comes to them through the prophets. He comes to them through these stone tablets he gives to Moses. He comes to them through the desert. Yet over and over again, they drift away. And eventually they become exiled from their own land. But in this passage we’re about to read, God offers them hope and tells them about a new covenant that’s coming that would help them to always remember his promise. I will be your God and you will be my people. And this is where we enter into the reading this morning. 31 “The days are coming,” declares the Lord,“when I will make a new covenant with the people of Israel and with the people of Judah. 32 It will not be like the covenant I made with their ancestors when I took them by the hand to lead them out of Egypt, because they broke my covenant, though I was a husband tothem,” declares the Lord. The days are coming when I will forgive their wickedness and will remember their sins no more. And this day that God talks about is of course the coming of Jesus. We know that in hindsight because Jesus himself told us it would happen – that after he ascended into Heaven, God would send the Holy Spirit to be with us, to guide us in our journey of faith. The death and resurrection of Christ was the catalyst to this new beginning because it was through this transformation from death to life that we were made clean. Had there been no resurrection, there would be no savior. There would have just been a good teacher who died unjustly. But BECAUSE Jesus conquered death, he showed the world he was truly God and had the power to not only bear our sins, but forgive them as well. So the death and resurrection of Christ marked the beginning of this new covenant with God when God would make himself known to each and every one of us, not through prophets or stone tablets or rainbows in the sky but within us. And this is what it means to us when God says, “I will put my law in their minds and write it on their hearts,” that the Holy Spirit would come and be accessible to us always. But if all that’s true, then why is it sometimes so hard to find God? I mean if God put it within us to know him, why is it so diffcult? God may be everywhere, but sometimes it feels like God is nowhere. Like God is Waldo in a Where’s Waldo picture. We search and search, but we just can’t pick him out of the crowd. We might find the clock or the pen or the compass, but God? He seems almost invisible. We know he’s there because the book tells us he’s there. But if God is everywhere why is it so hard to find him? Maybe it’s because we’re not looking in the right place. Leave it to Star Trek to come up with a Biblical answer. When God tells us that he is going to write the law in our minds and on our hearts, perhaps what he’s saying is not that each human being would instantly and always see God in everything. But maybe instead, that God through the Holy Spirit, puts within us this very need to find him. This quest we have for meaning in life, for understanding our Creator, is in fact the gift from God that he has put on our hearts. This drive to understand God is the DNA of our being that came about with this new covenant that God promised through Jeremiah. Most people in the world have a sense that there is a creator. In fact, only about 2% of the worldwide population is atheist. Most people around the world believe in something greater than themselves. We just don’t all label it as God. Some people identify God as Mother Nature or Lady Luck or Fortune or Chance. Some people sense that God can be found in other religions or in the stars. But nearly all of us have this identity with some kind of Creator. And it drives us in our lives to understand the meaning of life. Perhaps the best evidence that there is a God is in fact this God homing beacon that seems to be built within us. Perhaps the best evidence that there is a God is this God “homing beacon” that seems to be built within us. Jesus promised us that we would not be left alone. And we are not. We are not alone in this world. The Holy Spirit may not be something we can see, but it doesn’t mean that it isn’t active and working in our lives. The very fact that we search for God in our lives, the fact that human beings look for meaning in their existence, is itself evidence of God’s activity within us. Our challenge then is not to rest comfortably in this knowledge, but instead to share it with the world. Our challenge is to help others recognize the work that God is doing within them, so they can come to know him like we do. And the challenge is for us to know him better. And to do that, we must lead lives worthy of Christ. We must grow closer to God through pray and study, we must grow closer by being in community with one another and by breaking bread together. And when we do those things, we will follow this homing beacon back to God and in Christ obtain the peace of knowing who we are and to whom we belong. Follow the homing beacon of your heart and find God at the end of it. In the name of the Father and of the Son and of the Holy Spirit. Amen.